TechniTrader Support Staff and Services review - by Tony S. - "support and services have been nothing short of excellent!" Thank you for your analysis of the Oil Industry - incredibly insightful! Before TechniTrader under another training program, I had made some trades in upstream and downstream companies based on moving averages and a gut feeling about the movement of oil prices. I could discern that a relationship between the companies and the commodity existed, but I never really quite understood why. You really put a spotlight on the subject and provided a text book understanding, top to bottom and start to end. It was a very easy decision for my wife and I to become TechniTrader Students based on the knowledge, understanding, and wisdom that is evident throughout all of the program offerings. If I have a trade that goes well, I know why. If I have a trade go against me, I know why and more importantly I can actually learn from the experience. Please extend my appreciation to the rest of the (TechniTrader Support) Staff whose contribution to the TechniTrader products, support and services have been nothing short of excellent! TechniTrader Support Staff review - by Steve G. - "I have been successful on 11 out of 14 trades"
Just a little note to say thanks for the lessons and the daily analysis for my subscription. On my paper trading account for TechniTrader I have been successful on 11 out of 14 trades, 2 trades of which I didn’t even purchase. It has been since August, when I started that phase of the (TechniTrader Methodology Essentials Standard Course) ME10 course. It gives me added confidence to take it live. I also want to thank Martha (Martha Stokes CMT) for her early on bringing up Regional Banks, I researched various ones. I did use my live account to purchase an Regional ETF and did well. 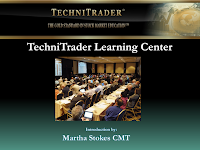 TechniTrader Stock Trading Courses Support Staff review - by Marita S. - "I am very grateful I have the chance to learn all this while being home with my kids." TechniTrader Stock Trading Courses Staff review - by Roger M. - "you are helping me so much, and it's going to have a massive effect on my future"
I just want to thank you for taking the time to answer all the questions I have thrown at you the last few weeks. I have been stuck and you have opened up my understanding to some of my stumbling blocks. I know it's your job but you are helping me so much, and it's going to have a massive effect on my future. It just means so much to have someone to help when I'm struggling. I told my wife the other day that I can see why basically all retail traders just never get anywhere because they can never clear any hurdles. I kind of feel sorry for them. Martha has been a fantastic teacher and you have been so awesome in extending your knowledge. Sometimes I feel like a dummy but it's part of the process. TechniTrader Services review - by Frank M. - "very positive ongoing experience with your educational approach at TechniTrader"
Because of my very positive ongoing experience with your educational approach at TechniTrader I have become a member of the MTA and I am now studying for the CMT #1 exam in October. Everyday I look forward to your market updates and everyday I read more of the literature that will help me to manage the client accounts that my company is responsible for. So a very sincere thanks for all you and your people do for us in the field. TechniTrader Support Staff review - by Chris M. - "You are truly remarkable." Thank you for your great write up on NVS (Daily Market Educator subscription publication). We are so lucky to have you (TechniTrader Support Staff) helping us (TechniTrader Students) to understand how all the conditions interact, and at the depth that you explain them. TechniTrader Support Staff review - by Brendan O'L. - "Thank you for your email and your fantastic assistance throughout the course." Thank you for your email and your fantastic assistance throughout the course. I have appreciated your precise insight into the operation of the market place. Please also pass on my grateful thanks to Martha for making this all possible and passing on her immense knowledge and wisdom... you are great teachers and educators and I cannot thank you both enough! I was truly in the dark and yet now I can see pathways that didn't appear before. It is highly likely that I will continue my education with TechniTrader given my experience! TechniTrader Support Staff Review - by Tom N. - "I made a great decision investing in your training." Can’t thank you enough. Your technical analysis is spot on, I’m so impressed. I am absolutely going to look at chart after chart until this becomes second nature. I will follow your (TechniTrader Support Staff) advice on the things to practice, on the lesson today. When I first got into trading, I knew this was going to be a game changer for me. My trading became stagnate after a while, the courses were easy to learn the way you layed them out, the charts are becoming more clear, having the technical aspect of this more and more it takes the emotion out of trading. I’m excited for the opportunity to learn from you folks, I made a great decision investing in your training (TechniTrader Methodology Essentials Standard Course). I’m dedicated and will achieve all of this, but as in all walks of life you never stop learning from an expert to become an expert. Thank you again, I'm sure you know you can change peoples lives with this training. Can’t say enough. TechniTrader Support Staff review - by Catherine W. - "total preparation for the learning journey and took care of everything"
Just a note to compliment you (TechniTrader Staff) on your service. The package was just delivered to my door and as stated by you there was no duty owed. When I opened the (TechniTrader Swing Trading) course material, it felt like I was a student who's teacher wanted total preparation for the learning journey and took care of everything. TechniTrader Stock Trading Services review - by Tyrone P. - "the (TechniTrader) Student Wiki has excellent information"
Hope you don't mind me telling you my (TechniTrader Methodology Essentials Standard Course) course has arrived, and the Student Wiki has excellent information. I also read the Market Structure Report . The report was excellent and an eye opener and helped to address one of many mistakes I have been making. I'm on the road to becoming a Semi-Professional!